...tap into latest audio technology including CD & MP3! 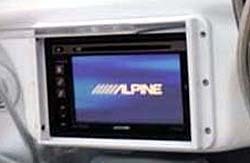 HUA360: Want the features of a DIN radio without losing your hand controls? Hate the idea of hacking up your stock wiring harness to make it happen? 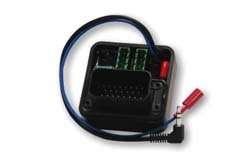 Our HUA Adapter allows you to plug and play your choice of supported radios (wired remote / steering wheel interface) directly into your stock wiring harness without giving up your hand control functions. No programming, no messing around with resistor networks, just plug your stock audio harness into one side, terminate your radio's harness into the other, and you're wired. Featuring an auxiliary Softswitch port, the HUA Adapter also gives you control of any 12VDC circuit you can imagine from your hand controls, like illumination or lighting. 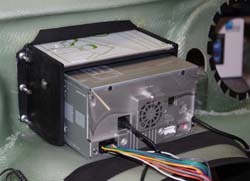 HUA470: Want to make installing an aftermarket radio a cake walk? Well here you go. 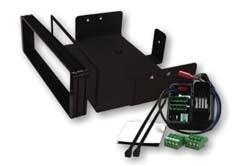 We've combined all three of our DIN radio installation products into one kit. Includes everything needed to install supported DIN radios in your factory fairing (except for the radio, of course). 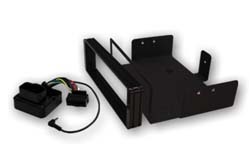 DC235 DIN Radio Cradle: Allows you to replace a stock Harley radio and an aftermarket single DIN radio. 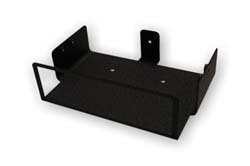 This all black painted steel cradle takes the place of your stock radio using your current hardware and mounting points. A rear mounting tab gives you almost a full half inch of horizontal tilt adjustment. The all steel construction provides the full support to your fairing as your stock radio does. The install is straight forward and professional. Includes detailed install instructions. No additional hardware needed. 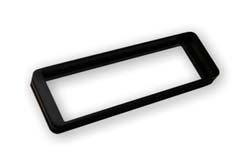 DB235 DIN Bezel: This black anodized aluminum single DIN bezel creates the perfect fit and look you are after when installing a new radio. Easily install an aftermarket radio in your stock fairing using 2 large black o-rings (included) to seal the radio tight. Included detailed install instructions. 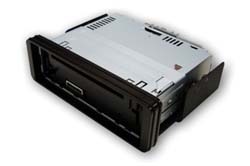 DK470: DIN Radio Install Kit, includes of DB235 and DC235 above. Note: The above Radio Adapter Kits allow you to maintain full handlebar controls but do not offer automatic volume control with speed. 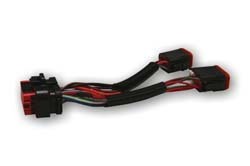 RAH9697: This adapter harness retro-fits 1996-1997 radio harnesses from the 8 pin and 12 pin Deutsch connectors to the 1998 and newer style 23 pin AMP connector. It can be used to install a newer style Harley-Davidson radio (Radiosound and Harman/Kardon) or a Sony radio with our HSA150 Sony Adapter, and it's also compatible with our Direct Connect amplifier harness. Things just keep getting easier. DS235B: The DS235B Splash Guard for Batwing fairings, the ultimate tool for keeping your aftermarket radio safe in the rain or washing your ride. Border is machined out of gloss black Lexan, cut edges are then polished to a high gloss finish. The tinted -transparent viewing window is made out of acrylic for durability, the DS235B not only functions but it looks great. The DS235B requires no modification to your inner fairing and simply presses in for a water tight seal. 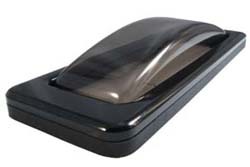 DS235R: The DS235R Splash Guard for Road Glides, the Road Glide opening is smaller and not as deep. So a slight mod is required to make it work with the above installation kits. 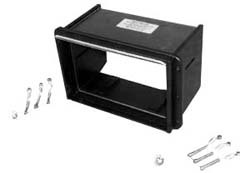 The DS235R kit includes the necessary hardware and template for the modification. Note: These products are to be used in unison with our DB235 Bezel and DC235 Cradle to ensure accurate fitment. Note: Takes up to 6 weeks delivery, special order item. WHK-35: Breakout harness. You will need this harness to gain access to the rear output channels that all Harman/Kardon radios come with from the factory. 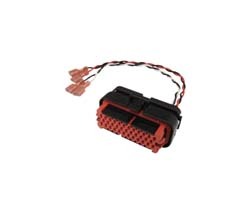 Whether you own a Street Glide with only two speakers and want to add another set or you are installing an amplifier and want your rear speaker output for signal input, this harness will give you what you need. Comes pre-terminated with twisted pair wire left/right and .187" and .250" female spades connections to make directly connecting to any of our PCS amplifier systems a cake walk. HA-1: The HA-1 mounts to the inside of the front fairing using an adhesive strip on the back of the module. The HA-1 uses dual active amplifiers to provide exceptional AM/FM reception. Note: 1996-1997 requires adapter harness WHA9697. Note: The HUA360 Adapter is designed for aftermarket source units that feature a 3.5mm jack or single wire input for WIRED REMOTE or STEERING WHEEL controls. The following is a list of current known or assumed* compatible source unit model numbers. *Since testing each model number listed is not possible, assumed compatibility is based on manufacturer specifications available at the time this information was gathered. Each brand of communication protocol was developed and tested using one or more source unit models from each manufacturer. Note: The HUA360 Adapter is designed for aftermarket source units that feature a 3.5mm jack or single wire input for WIRED REMOTE or STEERING WHEEL controls. The following is a list of discontinued known or assumed* compatible source unit model numbers. 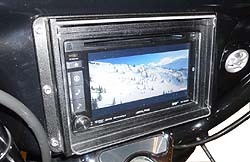 Note: The HSA150 Adapter is designed for Sony and Pioneer source units that feature a 3.5mm jack input for WIRED REMOTE or STEERING WHEEL controls. The following is a list of current known or assumed* compatible source unit model numbers.